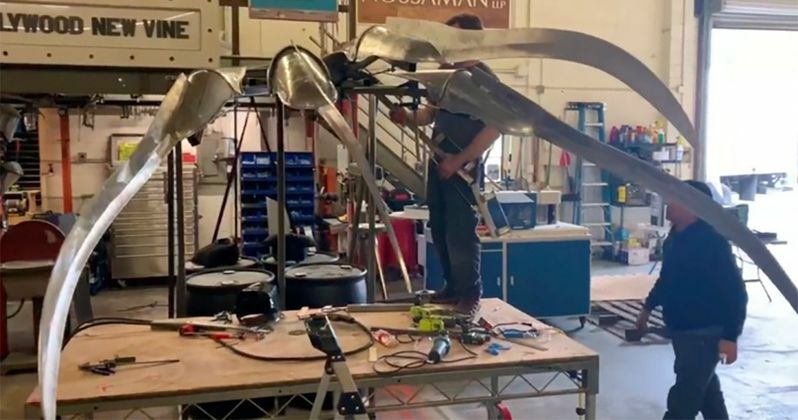 Freddy's iconic glove will soon be looming over Los Angeles, as the gigantic claw is being constructed for the upcoming I Like Scary Movies event that takes place on Wilshire's Miracle Mile this April. A sneak peak at the legendary knife hand famously worn by Robert Englund was released this weekend, ensuring that A Nightmare on Elm Street will have a big presence at the event. Released in 1984, A Nightmare on Elm Street was an instant box office smash, and turned dream demon Freddy Krueger into a phenomenon that spawned countless sequels, a TV show, comics and tons of merchandise. But this towering glove may be one of the craziest achievements in Freddy's run thus far. I Like Scary Movies says this about their upcoming event, which will be a fully immersive experience for genre fans to throw themselves into and enjoy. "I Like Scary Movies is the experience that all scary movie fans have been dreaming of. a groundbreaking immersive art installation that is a true celebration of some of the most beloved horror films. This is a unique opportunity for fans to interact and enjoy the films that they love in a completely new way with amazing photo opportunities to share with their friends. Come play with us as we take you back to The Shining, where you can "sink" into the infamous carpet from the Overlook hotel, before wandering through Beetlejuice's graveyard on your way to the Netherworld Waiting Room. Feel the fear as you enter Freddy's boiler room from A Nightmare on Elm St. and then revisit The Lost Boys on your way to Pennywise's lair. After all, we all float down here. When you visit I Like Scary Movies, you enter a multi-sensory experience where you can see, hear, feel and smell the environment." Tickets are only available online and are setup in 15 minute increments to ensure a smooth flow! The average experience lasts 60-90 minutes. Don't miss out on the first stop of the tour, opening April 2019 in Los Angeles. Tickets are only $39 each! The huge Freddy glove is part of the boiler room experience. And it will seemingly move on its own. As stated by the I Like Scary Movies team, quite a few horror classics will be getting similar treatment. As you may have noticed from the titles mentioned above, these come from Warner Bros. and sister studio New Line Cinema's extensive horror vaults. Several iconic scenarios will be resurrected in this real-world setting for everyone to enjoy. Freddy's swinging sharp hand will be fully articulated and hinged at the finger joints. Guests attending I Like Scary Movies will be able to pose with the oversized claw, made mostly from steel, aluminum and leather. The claw will loom large above the boiler room. This event is already proving to be quite popular, and the pop-up has officially been extended into June. Hopefully a few more sneak peeks will be released leading up to the big launch in April. You can find out more at I Like Scary Movies.